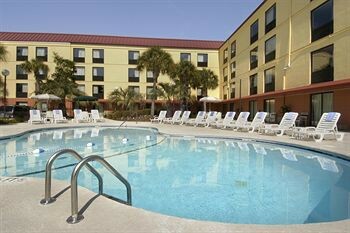 The Red Roof Inn Myrtle Beach Hotel - Market Commons is convenient to Art Museum of Myrtle Beach and Midway Park. This hotel is within close proximity of The Market Common and Myrtle Beach State Park.Rooms Make yourself at home in one of the 153 guestrooms. Complimentary wireless Internet access keeps you connected, and cable programming is available for your entertainment. Bathrooms with shower/tub combinations are provided. Conveniences include blackout drapes/curtains, and housekeeping is provided daily.Rec, Spa, Premium Amenities Take advantage of recreation opportunities such as a seasonal outdoor pool, or other amenities including complimentary wireless Internet access and a picnic area.Business, Other Amenities Featured amenities include a 24-hour front desk, laundry facilities, and a safe deposit box at the front desk. Free self parking is available onsite.